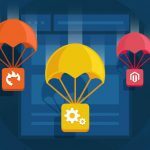 With everything available online, the eCommerce market is turning into a fierce battleground day by day. The cut-throat competition between rival companies is leaving them no choice but to come up with excellent market strategies so as to survive the market. One such effective marketing tool is Newsletter Popup Magento 2 Extension adding which to your store can bring in a bucket load of benefits. A lot of visitors may be exploring your website on a daily basis but hardly few among them may stick to your store and take interest in your business as a whole, rather than just your products. And those who try to know your business the process of reaching out to you may take so long that it might kill their excitement. 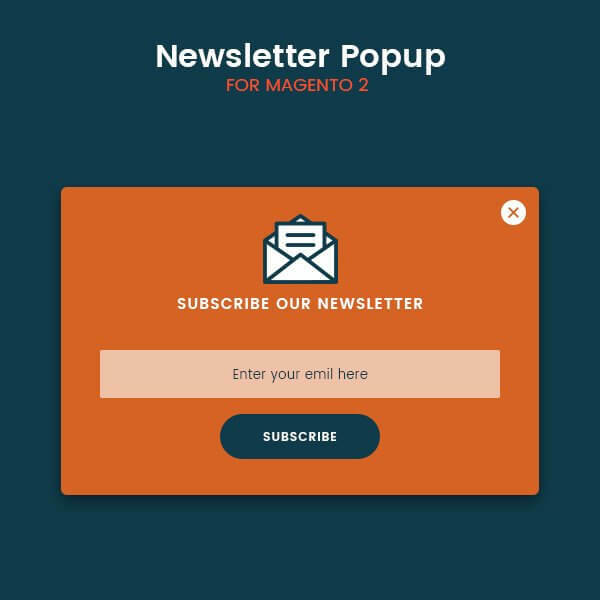 To prevent all this from happening, we have developed Magento 2 Newsletter Popup extension which will attract the visitor’s attention within the split seconds of time and clicking upon which a visitor may become your regular customer as well as a lifelong subscriber. Let’s see how? The newsletter popup plugin is nothing but a marketing tool which will benefit you, especially in email marketing. Check out its features and you will know for yourself. you to display popups of your products, services, newsletters etc. anywhere on your website. 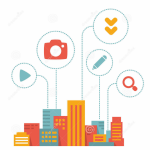 your customer to reach out to you within a click. you to generate leads as well as stay in contact with your clients and customers. you to manage and edit popups as you wish. Magento 2 popup extension gives the store admin the freedom to add, view and update newsletter popup in the backend. It comes with full customisation and usability for sellers. 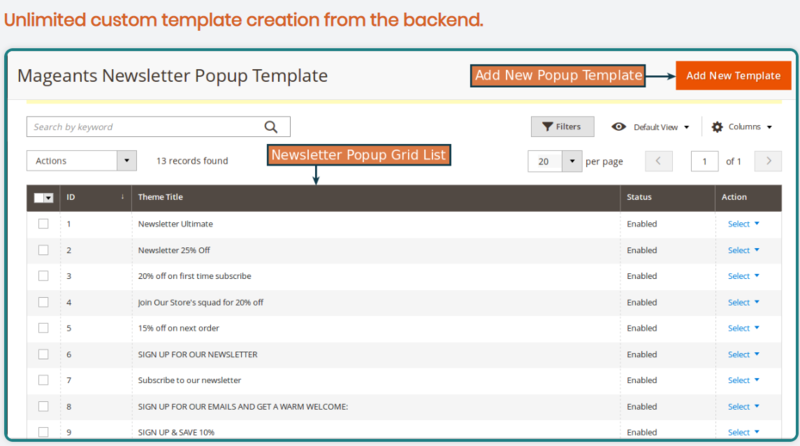 The store admin can also enjoy the benefit of creating custom templates for the subscription pop-ups from the backend as well. You can set the placement of popup as per your requirement like after page load or after page scroll. 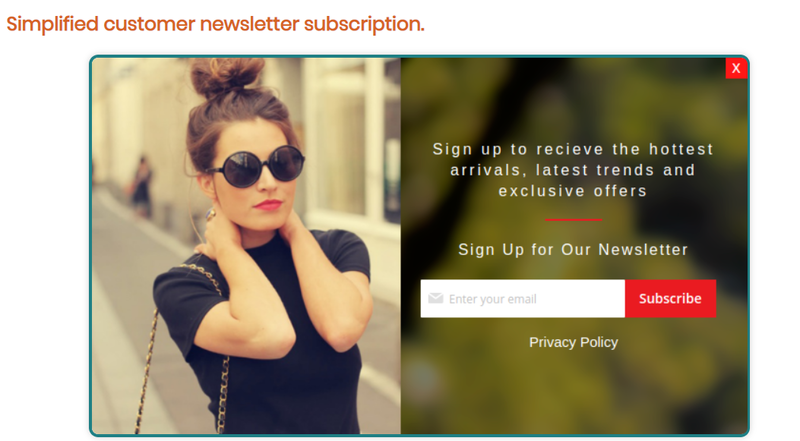 You can even decide what the popup is for like for example; a party invite, newsletter subscription, offers or more. With the help of Magento 2 newsletter popup extension, you can get enough email contacts of the recipients who would be interested in your company and its products and services and thus serve them better and stay in touch with them. By placing a popup right on the homepage of your website, you will be able to catch the first attention of the visitor and thus encourage them to explore the site further and lure them to buy your products or acquire your services later. You can also keep them updated about the latest news or offers of your store via your newsletters. Moreover, MageAnts have integrated Ajax-based newsletter popup plugin which ensures that the extension remains extremely user-friendly and delivers a seamless user experience to the customers, saving them from the longer loading periods in between pages and thus making them come back to you again and again. 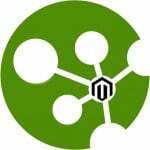 Magento 2 Newsletter Popup extension by MageAnts is a 100% open source extension which is a must-have for all Magento e-com sellers. For the ultimate benefit, our extension comes with added advantages like; free lifetime updates, 90 days free support, 30 days money back guarantee, and quick support. 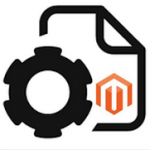 Since staying connected with your customers or clients is important in this digital world, Magento 2 popup extension act as the best marketing tool to do the job with ease which comes just at the price of $79.00. So, quit thinking and go get it right now if you don’t want to miss your customers as well as subscribers.